Alcantarea patriae (RSS) - see following notes. . . . . . . * Group photo. *Group photo: Left - Plant AJ. Grown in semi-shade under a Fern Tree. Labelled "regina". Right - Plant MK. Grown in bright light. 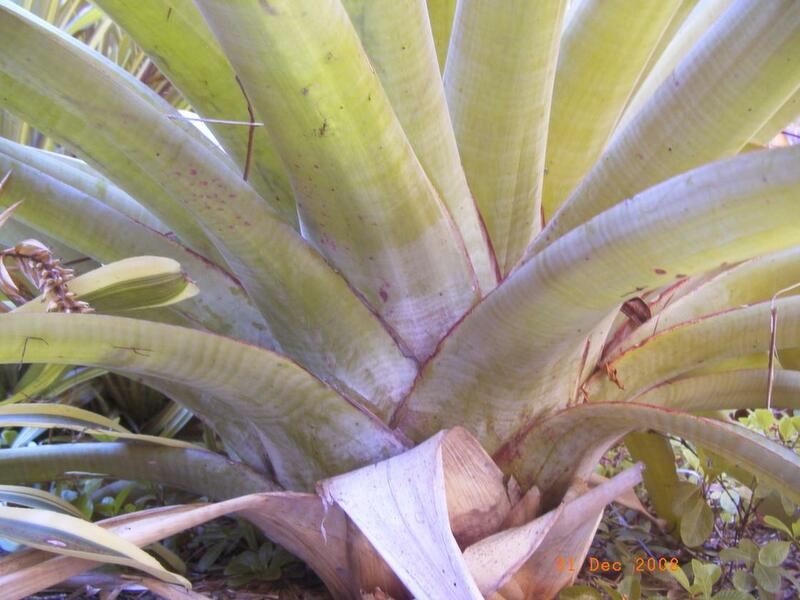 Labelled "Imperialis Green Form". 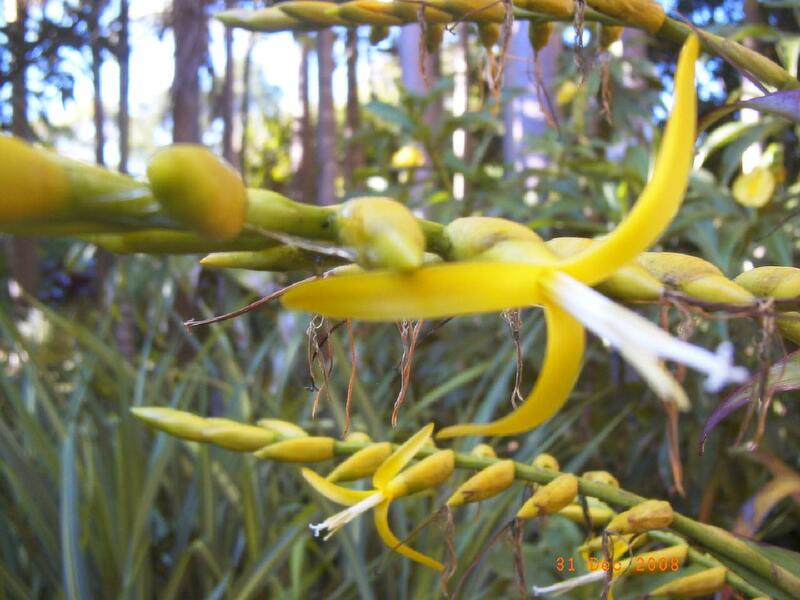 Exciting Rare Alcantarea Found Growing in Brisbane. - by Robert Smythe. MSc. So far I have found two rare species of Alcantareas in Brisbane and possibly a third in Far North Queensland. 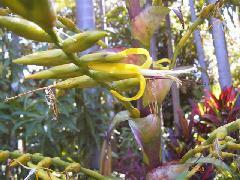 The first that I discovered was a large night flowering plant. I did a lot of taxonomical work on this and sent my work sheets to prominent botanists in Brazil. 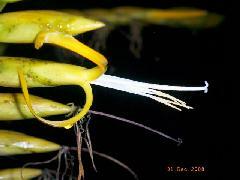 The reply was that it was a known as yet undescribed species. So that we can communicate on this I have given it a temporary name of Al. nova aff. patriae RSS. 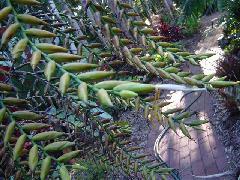 One of the two Brazilian botanists suggested it had an affinity with Alc. patriae. The third one will probably be a new species from inland Minas Gerias where a new population of Alc. 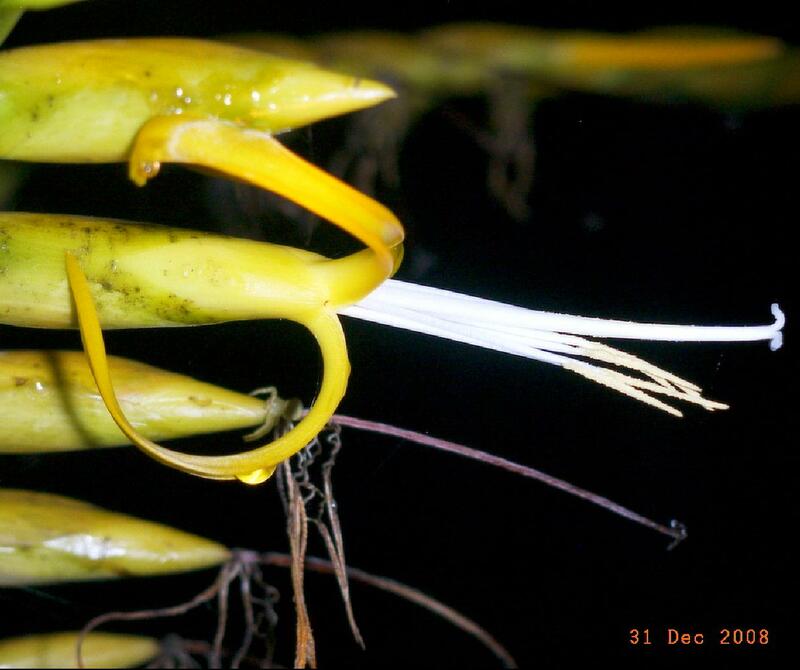 extensa and related species have been found in recent times. The original clones were found in Espirito Santos so there might be a lot of reclassification and new species described when this is all linked up. Only Alc. turgida (2007) has been published so far. How this third, possibly yet to be described species, got into the country is anybody's guess. If you read Arno King’s paper in Bromeliaceae 2002, we could make a good stab at how the other two got in. Back to the second one. 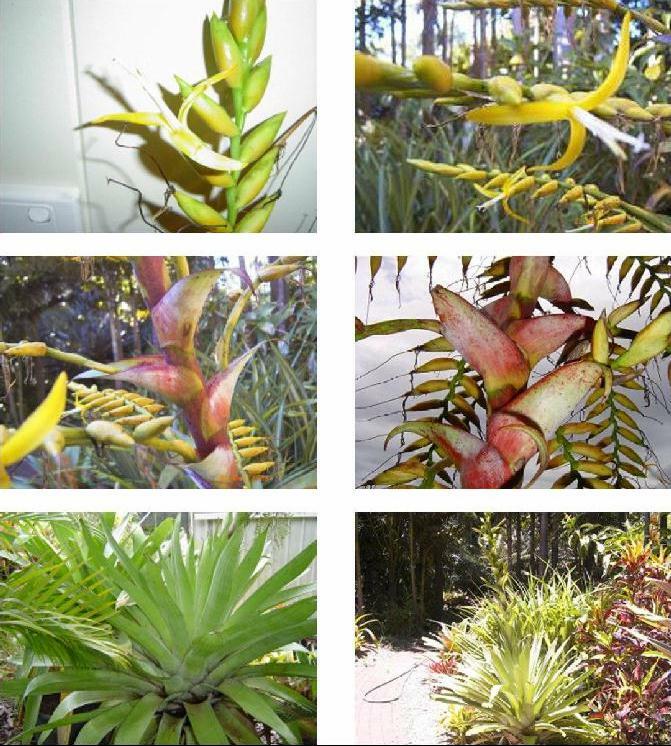 This all started after I requested in Brom Watch (a monthly rag that I write) that I would like photos of flowering Alcantarea sent to me as their naming is in such a mess and I hoped to sort some out. Margaret Kraa (MK) sent me a photo and subsequent material to study. By this time I had a good size data bank as a result of my previous study. Firstly I compared data with ones I had heard were around. Each time I found a major difference so excluded these plants. I worked through the remaining species and at the end I was left with only one species. I think I had eliminated 26 species. A lot of time needed. This meant it was Alc. patriae or some hybrid. I sent work sheets and photos to the botanist who described Alc. patriae in 2007. 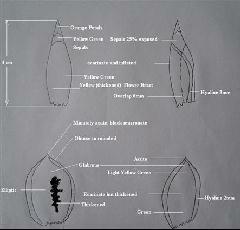 Below I have prepared an easy to read version for non-botanists. It was a great joy for me when Leonardo wrote back and confirmed that Margarets’s plant was Alcantarea patriae. Could you believe this? — Arnold James (AJ) invited me to his farm and there was another one in flower. Both Arnold’s and Margaret’s plants carried different labels of course. Understandable when it would not have even been described at the time. Similarities between the Brisbane Alcantarea and Alc. patriae. 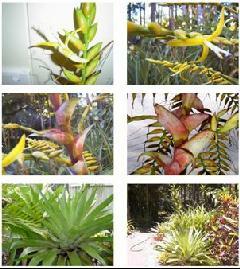 Both are large plants flowering above 2 metres. Both appear to have short trunks covered my dead leaves. They carry a large number of green leaves and the rosettes assume much the same shape. Leaves are rather narrow suberect and nearly straight and are covered with cross bands of white epiculate wax. 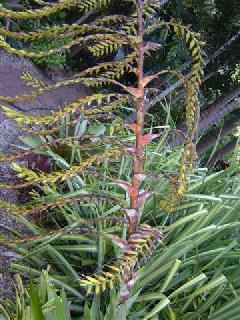 Leaves are same, concolour green, leathery and linear with transverse chalky striping. Leaf tips are acute. Scape is erect and appears to be green in both cases. First branch is a similar distance above the plants leaves. 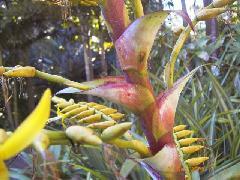 Photographs show primary bracts to be similar in shape and colourations. Branches: Both plants have a large number (20-30 combined range) of erect to semi erect branches with between 11 and 35 well spaced flowers per branch. 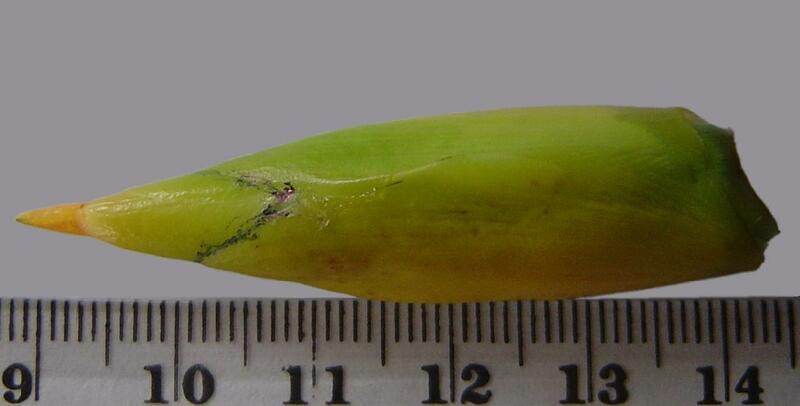 Petals: both fit within 8.5 to 10 cm in length, 8 to 10 mm wide. Floral Bracts have no keels but are both thickened towards the centre and towards the apex. Both have nerved membranous margins. Both are yellow to golden yellow and smooth. Both have the same dimensions. Sepals both obovate with graded yellow to green yellow markings. Both with same dimensions. 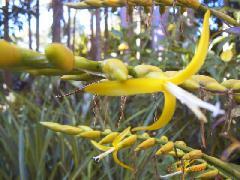 Petals, yellow, anchor shaped at anthesis, becoming recurved and flaccid with time. Stamens of similar size and both are not spreading. Scent : Both plants are scented. Scape bracts of Brisbane plants could be more foliaceous than those shown with patriae (very distant photo). Look equally divergent. Sepals and Floral Bracts more rounded and slightly more symmetrical with patriae. I have noticed with the Brisbane plant that with older flowers the subacuminate tip does fall off which rounds off the tip in the case of the floral bract. The sepal is far more rounded in patriae and I never observed tip drop. The ligulate petal appendages are some 40% longer in patriae. Patriae’s petals bend back more tightly as shown in the pictures. Sterile bract numbers do overlap but the Brisbane plant is at the very lower end of the patriae scale. Have I not recorded something significant? I have done my best with one visit and many e-mails. 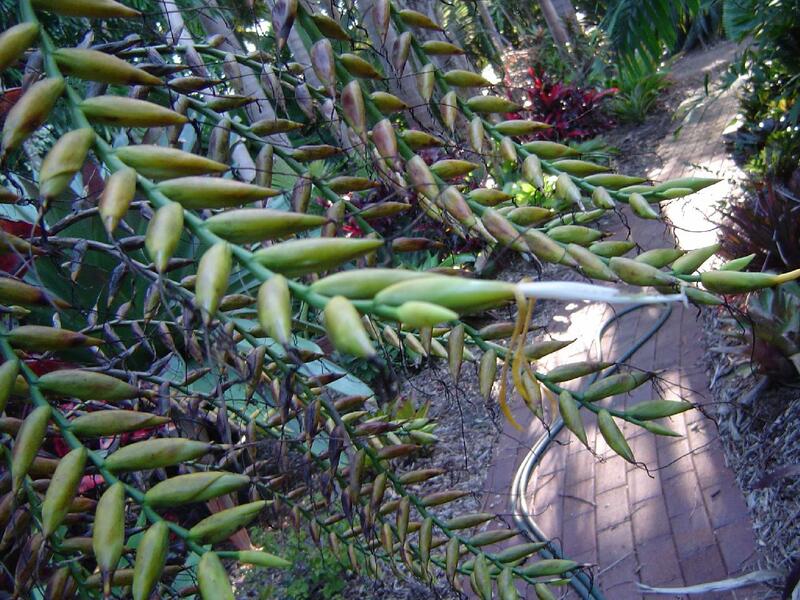 The branches of the Brisbane plant have become very drooped with age. Does patriae do the same? I would assume so. Could the ligulate appendages data be a mistype? My data is 24 x 2 mm where as patriae is recorded as 34 x 2 mm. I have a pressed sample and mine is right for me. Acknowledgement: Thank you Margaret Kraa for staying with me on this project and thanks to Arnold James for his enthusiastic but late involvement. Note: Groupings like (20 -30) mentioned above only indicate that the two plants both fit and overlap somewhere in this range not over the whole of the range. Response from the botanist who actually described this species. I sent him all my work sheets including drawings. His response is below. You've done a great job and did find A. patriae in Australia. 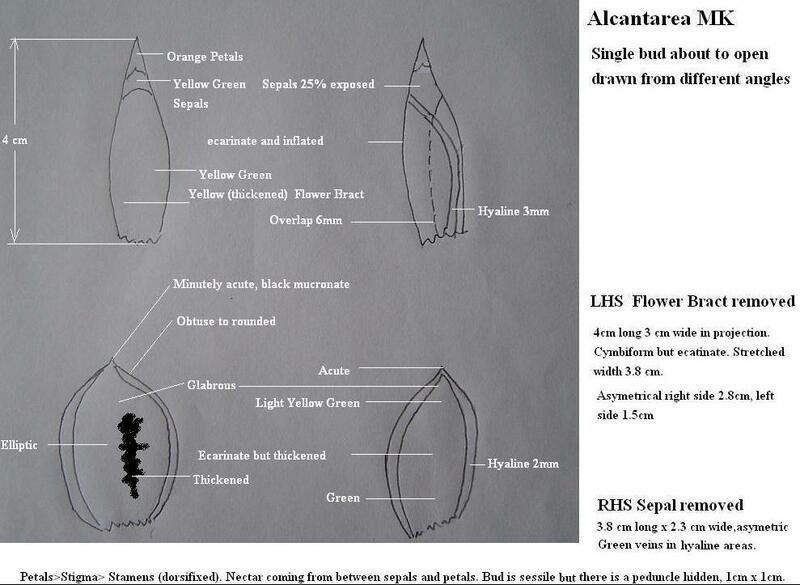 I have not seen the end of blooming at the type locality, all the plants I depicted in my paper are at the beginning of anthesis, but a friend of mine went to the same place later and he noticed that branches would bend downwardly at the end of flowering period. Good job and it is good to know that A. patriae is cultivated far away from its homeland.